You don’t have to spend a lot of money to hold team building events in your workplace, and they don't have to be ostentatious or complicated. You just want to create structured opportunities for employees to mingle. You can offer a team building lunch, a team building meeting, or a team building trip. You can schedule activities in the workplace or in your local community for your employees. It can be as simple as getting everyone together in a room. Provide lunch for the whole company or for a department or work team. Assign employees to various workgroups of up to 10 people to discuss and respond to work-related questions. If you don’t care who is in which group, one fun way to divide employees is to put numbers on the bottom of plates. All employees who have a "1" on their plates can take their lunch and meet in the library. Those with a "2" on their plates can move to conference room B. The team building lunch is a terrific opportunity to help employees get to know each other better, and who's not up for a lunch? Schedule employees to visit other departments for a take-an-employee-to-work day. Employees are always curious about what the others do. Satisfy their interest and introduce them to a whole new workgroup in the process. Job shadowing is a similar concept. It provides the opportunity for an employee to explore alternate career paths, too. It's easy to put together and it costs only the employees’ time. The opportunity to observe in another department allows employees to participate in team building that enhances cross-department cooperation and understanding. It also offers employees a chance to explore other career paths. Provide couches, snacks, and beverages and ask employees to schedule the space as they might reserve a conference room. Require that they consume all food and beverages from a catered lunch or all the break room snacks in a group experience. Employees across the company or in a single department can volunteer to read and discuss a particular book in a work book club. The company purchases the books for the employees and they'll meet weekly to discuss a chapter or two. Employees take turns leading the discussion about the chapter in the best book clubs. Then a second employee can lead the discussion about the implications for the company of what they're reading. Teams that meet frequently might not need icebreakers, but they can come in handy when you're forming a new team. They also work well when you're re-purposing a team. Help employees get to know each other and to improve their ability to work well together. Icebreakers are especially good for meetings. Make sure that every team has established team norms and relationship guidelines if they'll be working together for a period of time. One-on-one mentoring is important for employees and it's always recommended when you bring a new employee into your organization. Group mentoring by a senior manager or manager is another opportunity for team building as well. Employees learn new skills and approaches while furthering their relationships with coworkers. A second type of group mentoring involves having an employee who has a particular skill set teach other employees who want to learn. The employee can mentor groups of others to gain the skill or knowledge. Whether you're dining at a restaurant or grilling hamburgers at a local park, departmental lunches are excellent team building activities. There's something about sharing a meal together outside the office that encourages employees to talk and get to know each other. A mid-sized company can sponsor sports teams for employees that include baseball, golf, basketball, bowling, soccer, and more. The company can pay employee registration fees for running and walking events, especially those where the proceeds are shared with local charities. At one 5k run/walk, 36 employees entered together in company T-shirts. This is terrific for the company’s positive notoriety and community exposure, as well as for supporting employee causes. Activities such as weekly Weight Watchers meetings, yoga classes at noon, or group exercises in your fitness center can also offer team building opportunities for employees. Get an outside speaker or an employee with a hobby, interest, or particular knowledge or skill to meet with a group of employees to share information and experience. The employees bring their own lunches and the speakers are encouraged to make their sessions interactive to encourage team building. The shared interest in the topic encourages team building, as does the interaction. You can provide fun classes that employees and their families can attend after work or on weekends. They promote both family and employee engagement. Examples that have been successfully implemented by companies include cheese-making, beer-making, cooking classes of all kinds, lockpicking, and product-centered tips and sessions. The employees involved must do some serious team building to plan, organize, and attend. Employees might share interests in various outside-of-work activities. Provide the space, email lists, and occasional financial support to promote hobby group meetings at work. Companies have sponsored photography clubs, internet game playing groups, knitting clubs, and shooting interest groups. Team building activities in this area are unlimited. Whether your employees are running for charity, golfing for the homeless, building homes for poor families, or collecting food for people without food, volunteering as a team is an activity that produces lasting results. The camaraderie that employees build when they volunteer together is sustainable and powerful, and it flows over into the workplace. Almost all these activities can include the significant others of your employees and their children. Hosting children at work helps employee families develop friendships outside work which can cement team building in the workplace. Ideas for celebrations at work for families include trick or treating from office to office and carving pumpkins for children at Halloween, or holding tailgate parties in the parking lot before football games. You might consider putting up a big screen in the parking lot to show family movies in the summer months. Invite employees and their guests to enjoy annual sporting events such as the final game of the World Series and the final four games of the NCAA on big screen TVs. Hold a Christmas Eve holiday luncheon at work or in a local restaurant as employees scatter to celebrate the holidays. 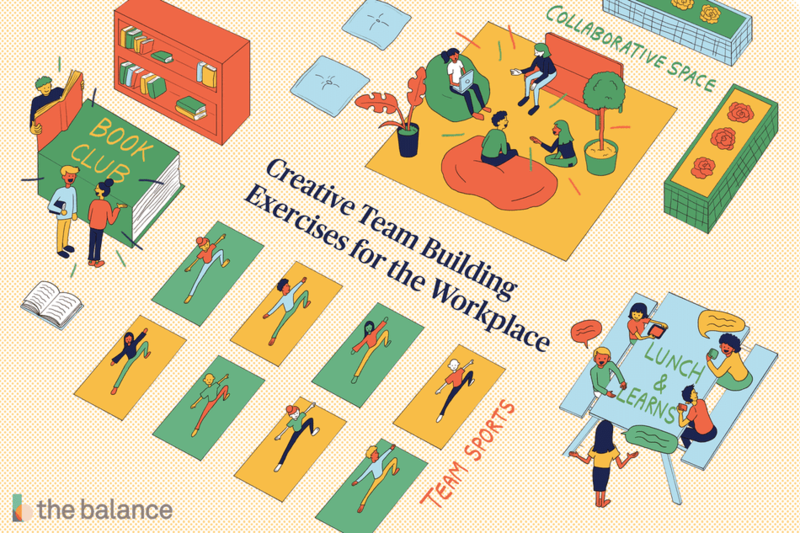 Team building activities in the workplace can stretch your imagination—and you're really only limited by your imagination. Offer some or all of these opportunities to become a great workplace. Low cost but highly effective team building activities can make you an employer of choice.